Although fun to visit and ride animals who are part of tourist attractions throughout the world, do you really know what the animal has been through or is going through during your time of enjoyment? In the case of elephants and many other animals who arrive at markets and tourist destinations in India, are sadly living miserable lives. India hosts 2 major attractions that bring both locals and pilgrims from Asia as well as traveling tourists from all over the world. 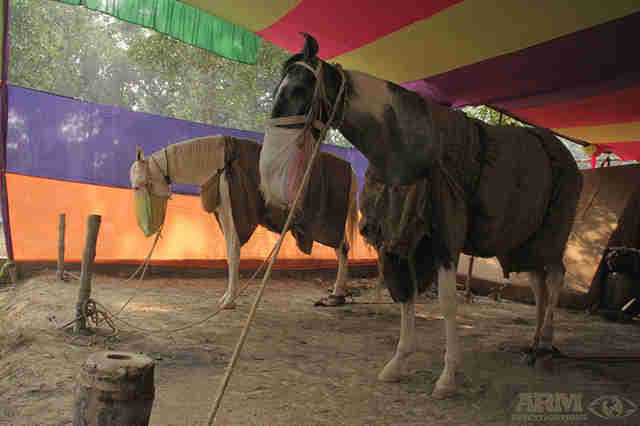 One of India's most famous festivals for locals and visitors from Asia is the The Sonepur Mela. This festival involves a massive gathering of people, from all over Asia, who come together to attend whats known as the largest cattle fair and animal trade, located in Sonepur, India. Lasting between 15 days to a month and typically held in November, animals including wildlife are famously sold and traded, many of them, illegally, and behind closed doors. The gathering promotes this illegal trading, selling and buying of animals and wildlife who are unfailingly sold and traded year after year disregarding legal aspects and provisions of the Wildlife Protection Act of 1972, which bans commercial trading of certain species of animals. Lined up for display, animal "owners" chain and bind the cattle, horses, camels and elephants to the ground with iron ankuses which restrain the animals using chains or hobbles with spikes and sharp edges which dig into the elephants legs and grounding rods to restrain them and keep them from moving even an inch. The animals are forced to stand, restrained in their excrements and filth, for days or until sold or traded out of their possession. Elephants with obvious and apparent ailments are given no sympathy, care or attention, they are simply for show and profit. Sellers garner their elephants with heavy and unnecessary embellishments, causing even more mental and physical agony. Fair-goers who capture and transport Asian Elephants to sell and trade at the fair are doing so without the legal capability. Acquiring, possessing, disposing of, or transporting Asian Elephants without written permission of the Chief Wildlife Warden or the Authorized officer under Section 40 (2) of the Wildlife Protection Act, 1972 is not permitted. Under the same act, Section 43 restricts the sale, purchase or transfers of captive elephants from one person to another for monetary consideration or any other profitable gain. These illegal sales are however, being conducted year after year, without proper enforcement. Even though many are aware of the illegality, this does not keep sellers, buyers and traders from attending the fair and conducting under the table business with wildlife and protected animals who are not meant to be contained in markets and sold to the public. Horses at this fair are unrestrained only to be ridded up and down a small isle in the owners' efforts to show the horses riding skills, then quickly bound to the ground again. Thousands of clearly emaciated and unhealthy cattle and goats are available for sale. Goats are confined to extremely small quarters while cattle are so weak that many, besides being tied to poles and trucks, cannot even stand. Other animals bought and traded at the fair consist of all breeds of dogs, camels, buffaloes, birds and poultry. Birds are kept in such small cages they can barely move around and are not provided food or water. The next concerning animal operation in India is a tourist attraction and profitable business flourishing in Jaipur, India. 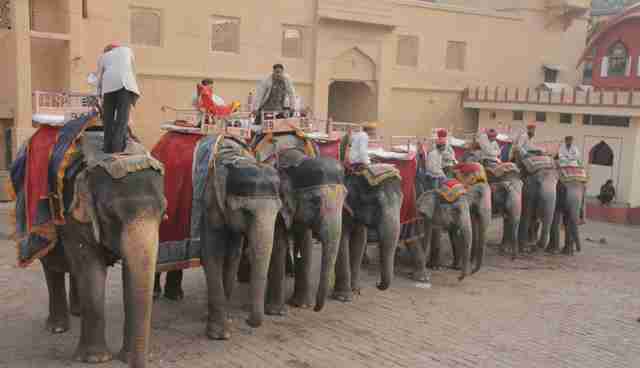 Travelers and tourists visit Jaipur to ride elephants throughout the city for fun and as means of transportation. Jaipur is the capital and largest city of the Indian state of Rajasthan in Northern India, and bring a vast number of visitors daily, due to it's relative closeness to New Delhi and other popular Indian states. Elephants sued for this purpose are referred to as "working elephants" and are becoming more and more profitable for business and elephant owners. Captive elephants used for rides, amusement and transportation are forced to work for years abused in the process, and basically live as slaves in jail. Working these elephants in these manners are a violation of Indian animal-protection laws, but because of the high demand for this attraction, more and more elephants are being taken captive to become working elephants.These elephants are being forced to carry up to 900 visitors per day, and often, multiple visitors per ride. The death rate among these captured elephants have been accelerating at an alarming rate due to being over worked, shackled, stabbed, pierced and wounded during embellishment (for attraction) and abused. Captors are seen to be quite aggressive towards the elephants and use force upon them in order to get the animals to push through their weariness. During the heat of the summer, many elephants suffer from exhaustion and dehydration yet are still forced to work throughout the day. 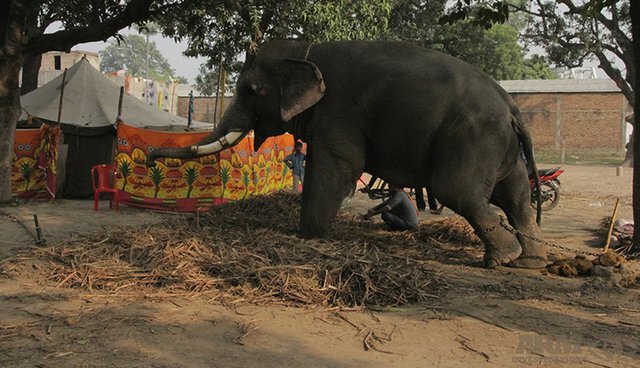 While the poor elephants await work, they are bound to the concrete in the same horrific manner as the ones sold at the Sonepur Mela. Foot sores, lameness, burnt feet and cracked nails which can lead to foot rot are common and serious ailments seen among working elephants who thus suffer immensely. 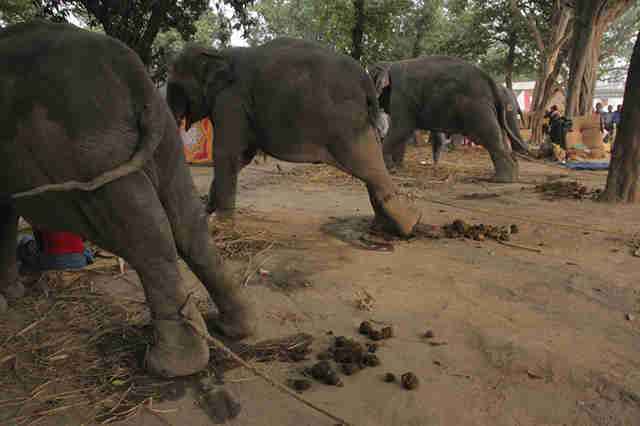 These ailments are caused by long periods of labor, being walked too far every day, being kept chained in excrement with nowhere for them to bathe and being bound to one spot during off time and sleep.Scars and assesses are often visible on working elephants legs from the chains and sharp devices used to shackle and contain them. Bruises and chaffing are left on the elephants body from beatings, chains, carrying heavy weight and the harnesses used for tourists to sit in. To ensure the elephants look their most decorative for customers, owners and captors pierce and drill holes into heir ears, tusks and tushes, which are then used to hang jewelry and heavy objects, subsequently mutilating the poor elephants body, all for the sake of appearance. Without direct permission of the State Wildlife Department, this a violation of the Indian Wildlife Protection Act, 1972. Also often seen, elephants used for work are blind, or visually impaired and still expected and to fulfill ride and attraction request. Besides the obvious physical damage seen on these elephants, they also succumb to mental illnesses as well. 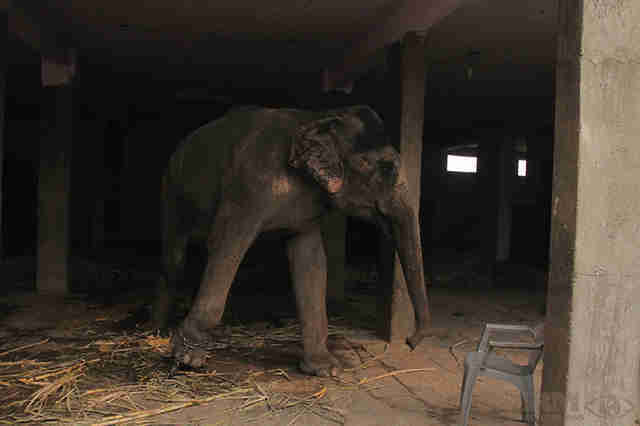 Constant swaying and head-bobbing are indications of frustration and serious mental deterioration which is also possessed by these working and captive elephants. Please do not hesitate, action needs to be taken and your voice needs to be heard in order to help these suffering animals. SIGN THIS PETITION NOW! !